After the automated restrooms opened in 2004, their floor-cleaning mechanisms became clogged by trash. Prostitutes and drug users sought cover in them. 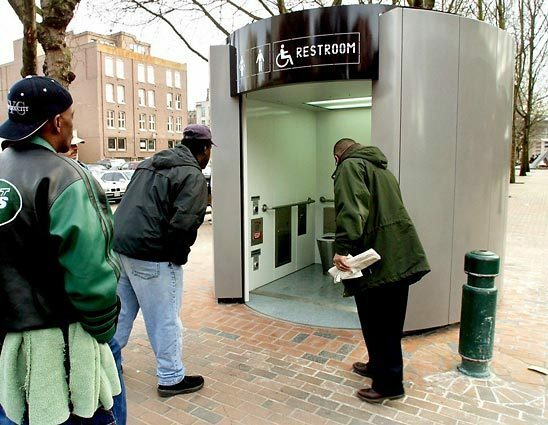 The Downtown Seattle Association reported that human waste on the streets increased, instead of decreasing, after they opened. It's too bad the city's idea appears to have been unsuccessful. As one Seattle council member notes in that Seattle Times article, public toilets are commonplace in Europe. Wonder why they don't seem to catch on here? New York City finally debuted its first pay public toilet a couple months ago, after 30 years of discussion. The city plans to add 20 more. Will they see a fate similar to Seattle's loos?